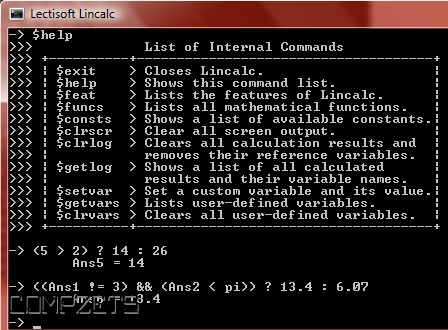 Lincalc is a console calculator for evaluating algebraic, logarithmic, and trigonometric equations. It is designed to provide a quick and simple interface to a very powerful calculator. 2. $help: Show a list of available commands. 3. 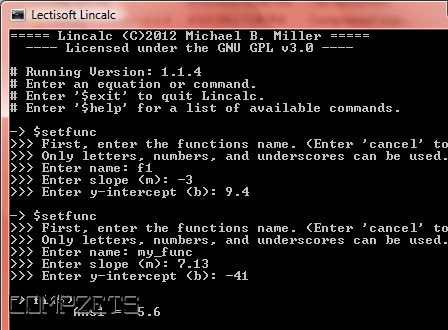 $feat: Lists the features of Lincalc. 4. 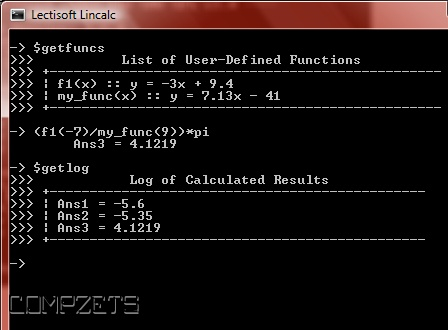 $funcs: Lists all mathematical functions. 5. $consts: Shows a list of available constants. 6. $clrscr: Clear all screen output. 7. $clrlog: Clears all calculation results and removes their reference variables. 8. 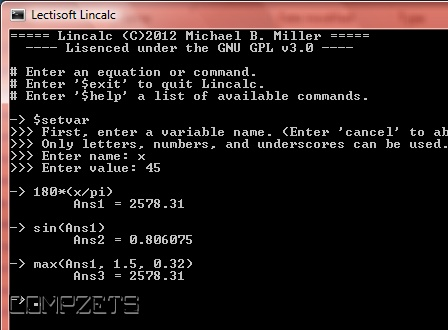 $getlog: Shows a list of all calculated results and their variable names. 9. $setvar: Set a custom variable and its value. 10. $getvars: Lists user-defined variables. 11. $clrvars: Clears all user-defined variables. 1. abs(x): Get the absolute value of x. 2. exp(x): Get e to the power of x. 3. sqrt(x): Get the square root of x. 4. min(x1,x2..): Get the minimum of all values. 5. max(x1,x2..): Get the maximum of all values. 6. sum(x1,x2..): Get the sum of all values. 7. avg(x1,x2..): Get the average of all values. 9. rint(x): Round to nearest integer. 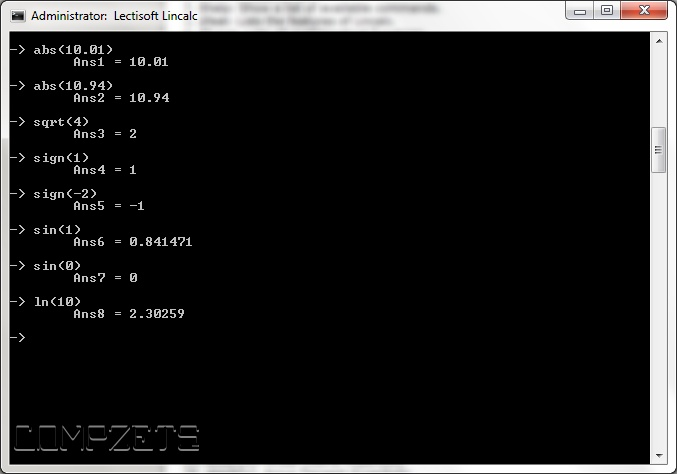 10. ln(x) : Logarithm to the base e.
11. log2(x): Logarithm to the base 2. 13. sqrt(x): Get the square root of x. NOTE: The new version supports user-defined variables, logical operators for conditions, and a wide range of mathematical functions each calculation that is made is stored in a result variable (Ans1, Ans2..) and can be referenced in equations. 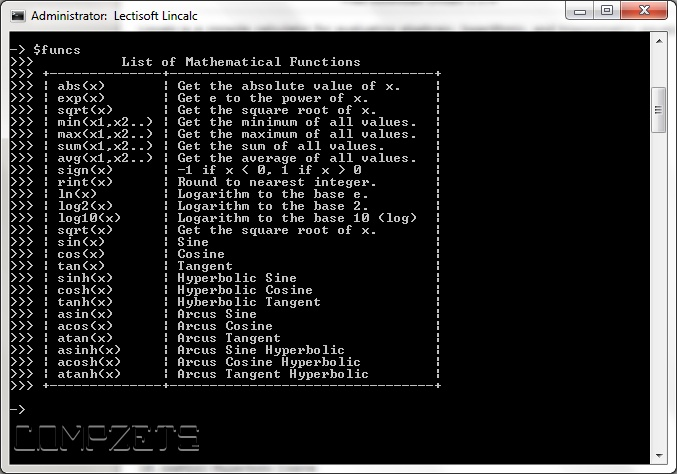 It also supports evaluation of multiple equations each separated by a ','. For a full list of features enter '$feat' into the command line.